The first thing is that you need to make sure that the email notification you got is really from Apple iTunes. Scammers and bad people may be trying to scam and trick you. Make sure that the email is legitimate. If you receive suspicious emails like these, you may report it to Apple via email (reportphishing@apple.com). For instance, emails from Apple will never ask you to enter your social security number, full credit card number etc. If you are asked these, then that is a suspicious email. Once you login, you will see all of your past purchases: Apps, Subscriptions, Books, Music, TV Shows. Click iTunes Store Support. You will be redirected to a new page. Here select either the Email or Schedule a Call option. Or you may choose the live chat option. Apple support representatives will help you resolve this issue. If you have unauthorized charges, change your Apple ID and password as soon as possible. Apple usually groups multiple purchases into one single charge. You may not receive separate invoices for each of these purchases. 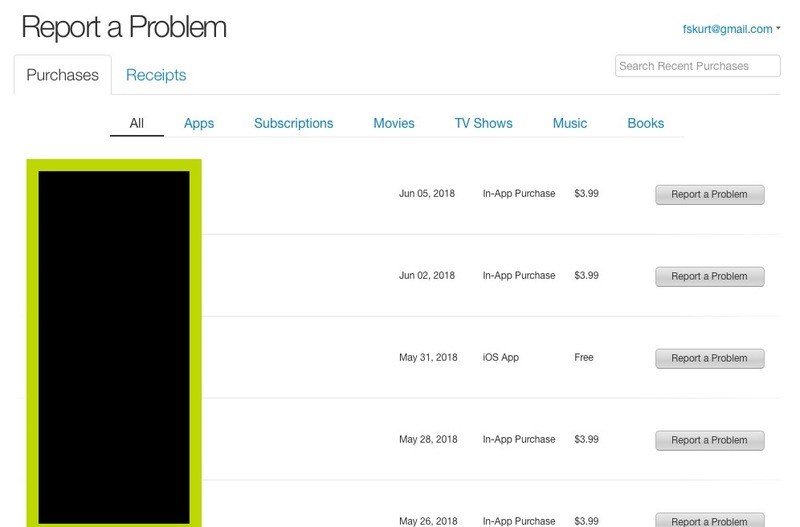 You can also easily view and monitor your past iTunes and App Store charges on your iOS device. Simply go to Settings > iTunes & App Store > Your Apple ID > View Apple ID > You may be asked to enter your Apple ID password, if so, enter your password > Purchase History. Here you can view your pas 90 day history. Pls refund the money that deducted from my account.. I didn’t authorise the any purchase from I cloud or App Store! please refund my money back into my account. I never purchased or authorize for iTunes or any apps. I wish to have the monthly charges from APL*ITUNES.COM/BILL866-712-7753CA stopped. I have ordered nothing from apl itunes.com. You have been charging me 7:99 every week! Please refund the money you have charged me! When i bought my phone at Verizon he said there was a free offer to try out Apple Music for a few months and I wouldn’t be charged. I would be notified by Apple and asked if I wanted to continue membership. Instead I was auto charged $9.99. I never once used it. Pls credit my account. Thank you. I keep getting billed $11.98; 9.98: $7.99:every month..I do not know what they are for..I am ready to tell Bank to refuse payments..how do I find out what they are for. I wish to have the monthly charges from ITunes.com/Bill 8001861087 IE stopped with immediate effect please. Ayla coşkun. iPhone kullanmıyorum 5aydır. Yeni telefon aldım. Lütfen 5aydır 3,99 hesabımdan kesmeye devam ediyorsunuz. Yeter. Artık kesmeyin. Ve 7 aydır kestiğiniz parayı iade edin. HOW do I contact Apple??? Please cancel my iTunes account I used espn plus for a free 7day deal and I forgot to cancel and I have been seeing a charge on my credit card each month. Would you please cancel that app as I never use the app and I no longer need it. Thank you for helping. Why do I get charges from iTunes that I haven’t purchased ? This is cyber crime ! iTunes step up! Cancel my subscription completely. I keep getting charges and now they are becoming more expensive. I have called and cancelled a couple of times and I am tired of going through the cancelation. Please cancel anything I have so people can stop costing me. I have not ordered iTunes and have no use for it. Please unsubscribe me and refund the last payment of $41.71 . Five monthly charges of $10.45. Cancel any future charges immediately. Please refund the total amount of $72.25 that was charged from my credit card. I did not authorize any purchase from iTunes and apps. I never once used it. Please credit my account. Thank you. Please stop all charges for ITUNES.COM/BILL IMMEDIATELY and refund all charges back to our account as we have never used or ordered any of your services. I have had an ongoing charge for $ .99 a month for quite sometime that a Verizon store employee put on my iPhone , cannot remember what it was for, but whatever it did not work for me. I would please like to get this charge taken off my card every month, as I do not need it. I would like to have charges stopped for ITUNES.com/BILL, and all charges refunded as I have never ordered this service and do not use it! I see we have been charged for a long time, unknown to me! If you could please refund the money to my account would be nice! Thank you! Is this a legitimate email or a scam. I do not have an apple account but was emailed a charge for a movie this morning. Please cancel all charges from ITUNES.com/BILL to my credit card. I have not authorized on-line purchase on apps. Stop charges effective immediately. Thank you. Please return the last payment and cancel any further payments. I never bought anything from the I tune store.